I realize that I’ve waited until we’re squarely out of summer and smack in the middle of winter squash season to share this recipe, but I’m going to stare pretentious foodie dogma in the face and say no biggie. You can wait for next year’s glut if you like, or you can just pick up a couple zukes from the grocery store and turn out this mind-blowingly easy side dish tonight. I mean, let’s be honest here—an in-season zucchini is not as big a deal as an August tomato or a fresh June strawberry. I’ve mentioned before that I used to not be such a fan of summer squash—though that fact is hardly worth mentioning anymore since I now love it and keep finding so many new ways to use it each year: sautéed and stirred into a pasta sauce, tossed briefly over high heat in a stir-fry, or roasted soft and sweet. I’m realizing more and more, however, that my favorite way to enjoy zucchini in particular might be raw. 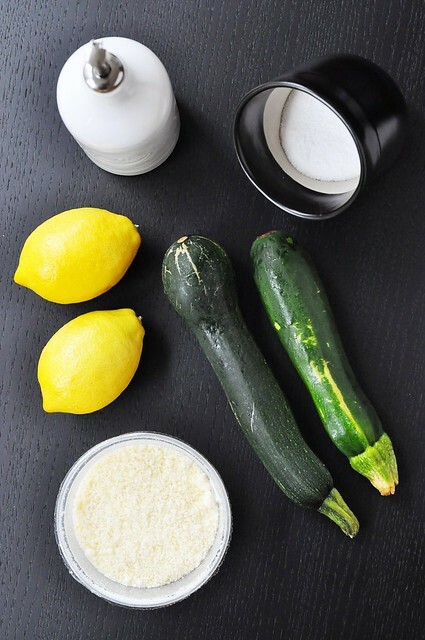 Raw zucchini has a clean, crisp flavor and is surprisingly versatile. I’ve served it before, sliced into rounds, alongside dip instead of chips, and one of my favorite restaurants in the city has a raw lasagna that employs slices of zucchini in place of pasta (of the dozen-plus times I’ve eaten there, I’ve only not ordered it once). The recipe I’m sharing with you today was inspired by another restaurant dish, a plate off the Summer 2010 Restaurant Week menu at Olives, that has been stuck in my mind for over a year: zucchini carpaccio. 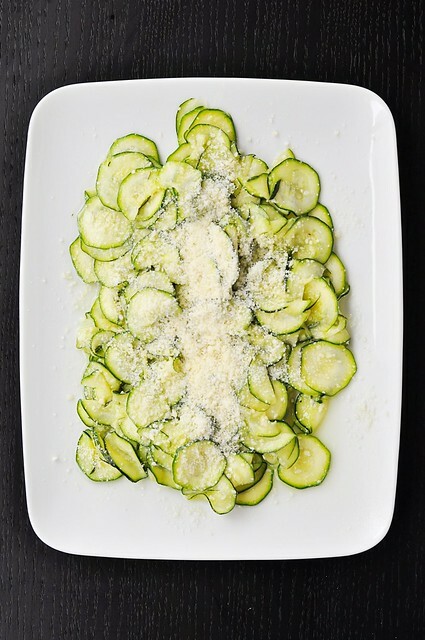 There’s a kind of perfection in the paper-thin slices of raw zucchini, the way they’re both tender and crisp, and delicately cling to the lemon, Parmigiano, and olive oil. The combination is bright, refreshing, and addictive. You can totally make it too—and you’ll be glad you did. This is already a permanent fixture in my repertoire, something that I plan to pull out at summer picnics and set alongside heavy, hearty dishes as often as I can stand. And I’ll just put this out there for those of you who are unsure about eating your summer squash raw: try not to be too surprised if you find yourself hiding in the kitchen, slurping up slices of raw zucchini, trying to resist finishing off the dish before it ever hits the table. This is one of those “to taste” recipes. The measurements below are approximate to what I use, and you may find that you personally like less of this or more of that. Taste as you go until you reach the right amount of tang from the lemon, silkiness from the olive oil, and nuttiness from the cheese for your palate. Also, for this recipe specifically, I prefer the pre-grated Parmigiano reggiano that is sold in small plastic tubs at the supermarket. It’s a textural thing that, for me, keeps this version reminiscent of the restaurant dish that inspired it. You can achieve the same texture by pulsing a hunk of Parm (minus the rind) a few times in a food processor, or simply grab a wedge and grate it to your liking. 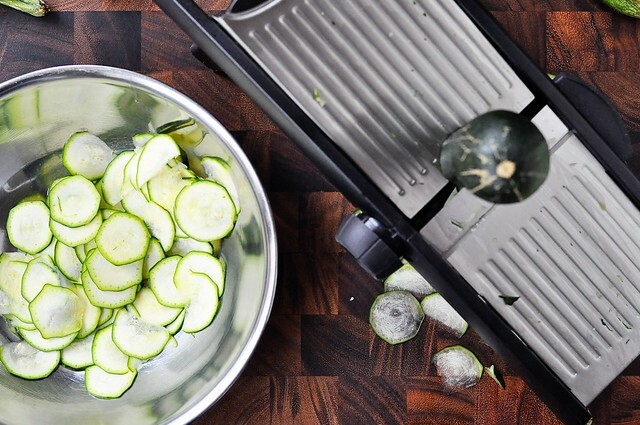 Using a mandoline or a very sharp knife, slice the zucchini into paper-thin rounds (alternatively, run a vegetable peeler lengthwise to create long, thin ribbons). Place in a medium bowl and sprinkle with a big pinch of salt. Drizzle in the olive oil, squeeze in the juice of one lemon, and add a handful or two of the Parmigiano reggiano. Use your hands to toss the zucchini with the other ingredients, separating the individual slices with your fingers to help distribute evenly. Taste and add more lemon (or anything else you’d like to taste more strongly) if it seems a touch bland. Toss again to coat. 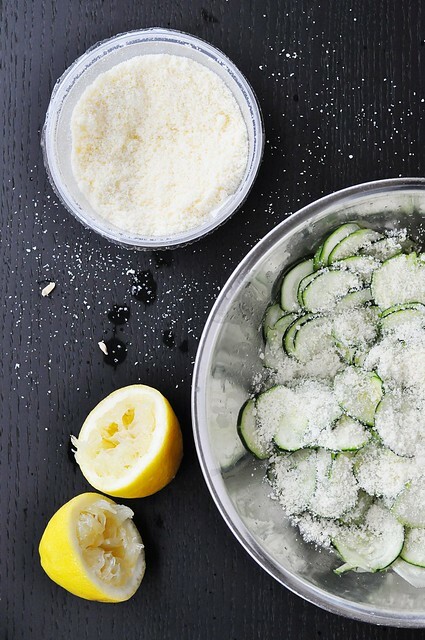 Spread the zucchini carpaccio on a platter, sprinkle with another handful of Parm, and serve.